“In this special edition, we invited scholars from the fields of Curriculum Studies and Disability Studies to present work about the curriculum of dis/ability. The scholars featured in this special edition have taken up the call in a variety of ways, including auto-ethnographical reflection, analysis of existing curricula, arts-based theorizing, and reflections on classroom interactions. Through these works, we offer not a prescriptive approach to infusing Disability Studies into Curriculum Studies (or vice-versa), but rather an invitation to our readers to theorize through intersectional and interdisciplinary lenses” (p. 1). Perhaps one marker of excellent work is that early readers are already recommending that students and scholars read it now! Since the final copy hit the editorial mailbox a week or so ago, I have been reading and suggesting the articles to students and colleagues. On behalf of our managing editor, Kelly Waldrop, thank you to everyone for your assistance in the transition to our new editing team, for sharing such outstanding work to be read and discussed and used. Please read and comment on the pieces in your work ahead. 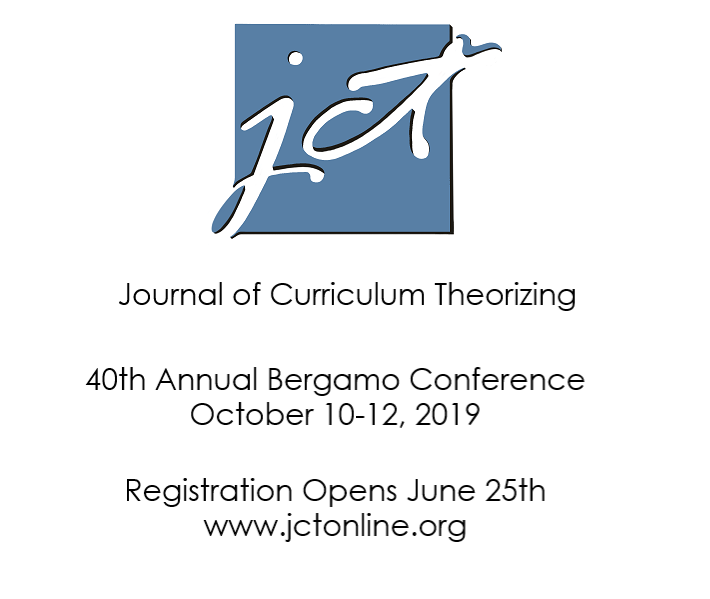 Thank you to all who have helped us with the leadership team transition for the Bergamo Conference and the Journal of Curriculum Theorizing. Special thanks to Rob Helfenbein and Gabe Huddleston who have worked hard to make this a seamless process. We also want to thank YOU for being patient as we get the new leadership team in place (see member names below). Looking forward, we are happy to announce that our Annual Conference at Bergamo will be October 10-12, 2019, in Dayton, Ohio. Please hold the dates and plan to join us for the meeting. More details about the conference theme will follow in the late spring Call for Proposals announcement. 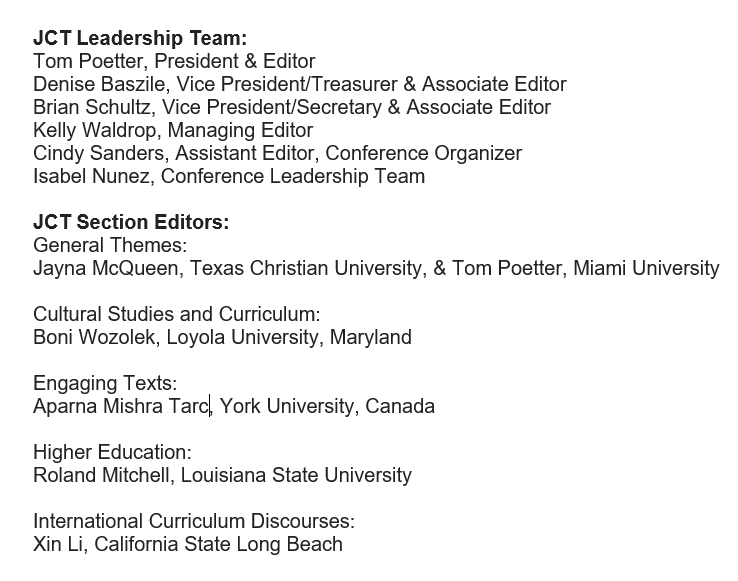 The good people who have agreed to serve as editors for the journal are also listed below.